At long last, the eagerly-anticipated finale to the Extinction Cycle. I was very glad to finally be able to get my hands on this (Oh, the hardships of waiting for the author to write, then edit, a new book!) and dig in. And I was not disappointed. Not one bit. It was really good to get back in touch with Reed, Kate, Horn, Fitz and Rachel. Can’t say I was as pleased to be reaquainted with some of the other characters, but I suppose villains must have their moments. I didn’t do a re-read of the previous book prior to picking this one up, so I did have to stop and think a few times at the beginning about just where the previous book had left off – but that was my own fault for not being prepared. Smith gave an adequate account to recall events to my memory, and that was all that he needed to do. I actually found it fun to be reminded of where things were at. One of the hazards of reading a lot of books. Also, huge kudos to Smith for not dropping a single thread. This story is very complex, with action taking place all over the Northern Hemisphere between Alaska and Rome, and each story line was tightly controlled and clearly related. The quality of writing in this book was of a very high standard, and exactly what I’ve come to know and expect from Smith. The storytelling too was exemplary – Smith certainly likes to keep us on the edges of our nerves! But then, what would a Smith book be if that wasn’t the case? 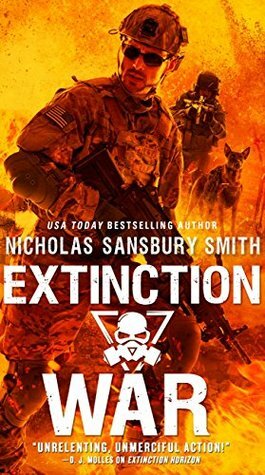 Overall, a MUST read for Extinction Cycle fans, and if you like post-apocalyptic fiction mixed with military action, biomedical disaster and some (highly-plausible, thus scary) science fiction, then do pick up Extinction Horizon, the first in the series. A solid five stars from me. Thank you for the wild ride!! 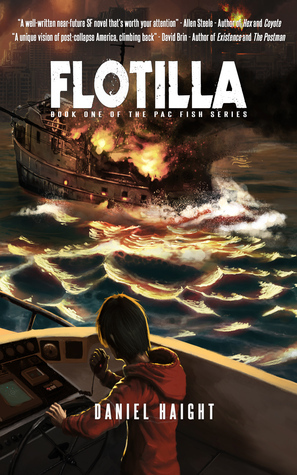 Flotilla is an unyielding exploration of people and technology in a perilous world. When 15-year-old Jim joins his dad on Colony D, he doesn’t see it as the new frontier in green technology and sustainability; he sees a free pass out of rehab to spend the summer on a man-made island in the Pacific. Jim thinks his troubles are marooned on the mainland, but it turns out that his dad has secrets of his own. When things stop adding up, and Jim becomes suspicious, he makes a horrible discovery. But now, that’s the least of his problems. The United States come under attack, and Jim’s parents go missing. Drug runners and modern-day pirates are coming to settle a score. All he and his sister have now are an old boat, limited supplies, and each other. Jim must race against time if he wants to escape the catastrophic meltdown of civilization. Jim is fourteen years old, and an alcoholic. Or at the very least, a party-going heavy drinker. He comes out of hospital after his latest round of drinking, and is ‘sentenced’ to spending a summer with his Dad, Rick Westfield, on Colony D., a man-made island in the Pacific that houses those farming fish for an on-shore company. Ostensibly, Jim’s father is a fish farmer. I felt quite sorry for Jim through most of the story. From everything he says (Jim narrates the story), he really is trying to get his life back onto an even keel. He learns (not with much help from his dad, Rick, mind) that life is better when one stays away from alcohol, and he just wants to be a normal person. The only problem is, Rick is anything but normal, and keeps throwing Jim into deep ends that he has to wade out of – not helpful deep ends either, much. Jim eventually figures that Rick is running “scams” (deals) with other people in Colony D – though he never directly admits to doing so – and Jim keeps getting caught in the middle of them. There were some really touching moments when Jim speaks of his little sister Maddy, and one can tell, despite the issues he has with alcohol and his parents, he really loves and cares for her. But is helpless at the hands of his parents, who barely attempt to comprehend him. Though this book does end on a post-apocalyptic note, I wouldn’t classify it as post-apocalyptic. The vast majority of the action takes place on Colony D (the flotilla of the title), and is a study in the culture of the colony. It follows Jim’s adventures, or misadventures, as he gets to know the inhabitants of the colony (at the hand of his dad, who is rather off-hand about most things), all while trying to not drink. It was, for me, more reminiscent of a disaster story, when all hell breaks loose towards the end. Overall a very interesting read, and I would be happy to read another book by Haight.